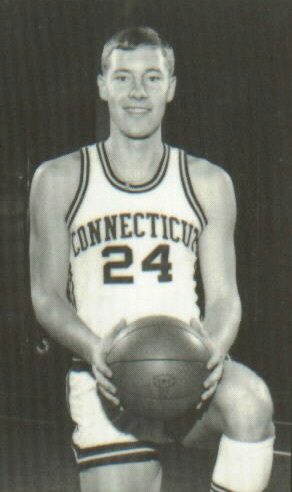 Bob Staak played both the Guard and Forward positions for the UConn Basketball team from 1968 – 1971. He’s been an assistant coach at UConn, a head coach at Xavier University and Wake Forest University, and has spent most of his career—12 years—as a National Basketball Association assistant coach for several teams. He is presently Pro Personnel Scout for the Orlando Magic of the NBA. He is also a member of the UConn Basketball All Century Ballot. I spoke with Bob recently and he shared his experiences as a player and a coach throughout his career. Bob started playing basketball when he was five or six years old in youth leagues. His mother and father both played basketball. Bob’s father played at Columbia University before the depression for a year-and-a-half and his mother was a semi-pro player who scored 88 points in one game. Bob grew up in Darien, CT but often went to Stamford, CT (close to Darien but a bigger city) and New York City, to play at the YMCA’s and the parks against older, better players than he was at the time. “I loved playing basketball. I went to Darien High School and became the all-time leading scorer there and ironically, I graduated in 1966 and I’m still the all-time leading scorer, 1,158 points when there was no such thing as a three-point shot.” About 100 universities recruited him, including North Carolina, South Carolina, Virginia, Providence, Kansas, Florida, Connecticut and St. John’s. He decided on St. John’s in New York for his freshman year, but it didn’t live up to his expectations. There were no dormitories so he was living in an off-campus apartment that was not what he envisioned college to be. He was enrolled in business courses and during his freshman year he realized he wanted to be a coach. He needed to change his school major to school education but St. John’s did not offer the concentration he wanted. Bob transferred to UConn, had to sit out a year from basketball like all kids who transfer, then went on to play three successful years at UConn ending his career at UConn as the fourth all-time leading scorer at the time (now he’s 20th). “I was All New England and All Yankee Conference and District One All American by TV Guide.” A two year co-captain, Bob was also named the team's Most Valuable Player his senior year as well as receiving the UConn Club Award as the Outstanding Senior Athlete. After graduating from UConn, Bob signed a contract with the Pittsburgh Condors of the American Basketball Association and was there for two months before becoming the last guy cut from the team in preseason. He came back to CT and played in the New York State Pro League on weekends for a year while also coaching at East Hartford High School. The following year he was invited to play for the Kentucky Colonels of the ABA. He had a contract dispute and decided to end his playing career. Bob became an assistant coach at UConn and worked for his college coach Dee Rowe for two years. Then he went to the College of William and Mary in Virginia as an assistant coach for a year. Next was University of Pennsylvania as an assistant coach for four years under Hall of Fame Coach, the late Chuck Daly. While there, in 1979 the team made it to the Final Four. Although they lost in the semi-finals to Michigan State, who had Magic Johnson, Bob said it was very exciting. “Then I left Penn and was an athletic director and head coach at Xavier University in Cincinnati. We went to the NCAA in 1983 for the first time in 22 years.” The following year they were one point away from going to the Final Four in the National Invitational Tournament. They had won 22 games back to back in those two years. Bob became the head coach at Wake Forest University for the next four years. Moving on, Bob became an assistant coach in the NBA for the next 12 years. He was with the LA Clippers for a year then he spent a year as a scout for the Washington Bullets, then he spent three years as an assistant with the Miami Heat. He went back to the Washington Bullets, this time as an assistant coach for three years and briefly as the interim head coach, then three years with the Golden State Warriors. Next was a year in Vancouver with the Grizzlies, followed by a year with the Grizzlies when they relocated to Memphis. Bob spent a year and a half working for the NBA League Office as an “on-sight observer” for the Washington Wizards games where he observed the officials, the crowd and whatever may transpire during the course of a game. Bob left coaching to pursue other things but already misses it and thinks he’d like to get back into it again. Bob told me that he thinks he’s the only former UConn player that has gone on to coaching in the NBA. He has been employed by the Orlando Magic for the past 6 years. Bob was inducted into the Xavier Athletic Hall of Fame in 1990, The Greater Cincinnati Basketball Hall of Fame in 2002, The New England Basketball Hall of Fame in 2009, and in June 2010 will be inducted into the UConn Fairfield County Sports Hall of Fame. Looking back at his coaching career to this point in time, Bob’s most memorable experience was during his time at Xavier University. Xavier hadn’t had a winning situation in 22 years and building a program where the record while he was there was 60 wins and 22 losses, they went to two tournaments and now Xavier is a very well respected highly ranked program. Bob is married to the former Donna Durant of Rockport, MA and currently lives at Lake Norman in Cornelius, North Carolina. He has a son, Corey, 28, a graduate North Carolina State University and a step daughter, Jenna Caiazzo, 26, a graduate of Mount Holyoke College and Boston University. They both are presently living and working in the Carolinas.